Small Chain Catshark in a home aquarium. The chain catshark (Scyliorhinus retifer) is a popular public aquaria display. It is a small and slender shark with a blunt-tipped snout. Their coloration is a yellowish-brown with a black chain link or reticulated pattern. They have small, narrow oval-shaped eyes and a small mouth with a lot of tiny teeth. Their two dorsal fins are placed well posteriorly with the second dorsal fin being half the size of the first. Their skin feels smooth due to the small denticles that are narrow and flat. Although the purpose is unclear, they have been documented to have a biofluorescent activity, at least in the wild. The chain catshark, sometimes referred to inappropriately as the chain dogfish, belongs to the family of sharks known as Scyliorhinidae. This family is termed catsharks because of their elongated cat-like eyes. The family comprises a large group of small, bottom-dwelling sharks that are slow-moving and non-migratory. In the western Atlantic, they are found on the outer continental shelf and upper slope in water ranging from 45 degrees Fahrenheit to 55 degrees Fahrenheit. They are a demersal species found congregating around structured habitats or man-made objects from Georges Bank, Massachusetts through the Gulf of Mexico to Nicaragua. They are very abundant in the middle of their range. In the northern part of their range, they occupy depths of about 120 feet to 750 feet, whereas in the southern range they are found at greater depths of down to 1800 feet. They are born at about 4.5 inches and grow to a length of 18 inches. Their growth rate decreases exponentially as they mature. They reach sexual maturity at about 15 inches which takes about seven years to attain. Females tend to be larger than males. The larger catsharks (12 to 18 inches) prefer rough bottoms whereas the small catsharks (4 to 12 inches) prefer smoother bottoms. As juveniles they eat polychaete worms and crustaceans, but as adults they prefer small fish and cephalopods. Their mode of reproduction is oviparity (egg-laying). Behavioral observations involve the male biting the female’s pectoral fin until he has a firm grasp. He then wraps his body around the female for copulation. It has been noted that females can store sperm for a couple of years. The female deposits eggs in pairs after an unknown gestation period over an object. 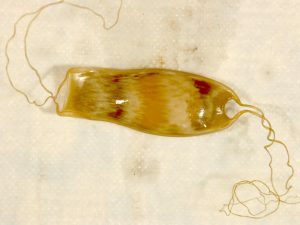 The small amber-colored eggs have long stringy tendrils at each corner that allow the eggs to stay attached to the object. The eggs hatch in about 8-12 months depending on temperature. They are an attractive shark for the home aquarium due to their shark-like appearance and small size. They acclimate readily and spawn successfully in captivity. Most of the time, they will rest on the bottom of the tank. However, they are very active during feeding and at night, so a cover is necessary. A 120 gallon aquarium would be sufficient to house one chain catshark. A 300 gallon aquarium can comfortably house a pair. 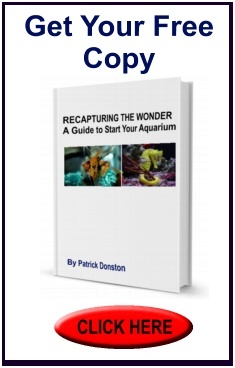 However, being that the water temperature should be kept between 50-65 degrees, a chiller is necessary and the tank should be a species only aquarium. The salinity should be kept between 1.024 and 1.026. A UV is optional being that sharks are resilient to many types of diseases. The tank should contain sand and have strong biological filtration because sharks produce a lot of waste. Frequent water changes should be done to keep nitrates below 10 ppm. The chain catshark is non-aggressive and will eat almost any type of raw seafood that is small enough for their little mouths. 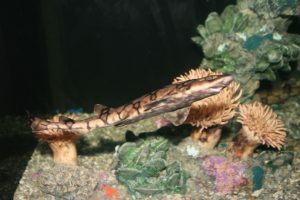 In conclusion, the chain catshark (Scyliorhinus retifer) would make a perfect aquarium inhabitant due to its small size and uniquely attractive characteristics.